India, a nation that boasts of nearly 500 million Internet users and the No. 1 market in the online retail space, should already be the global leader with regards to eCommerce. According to a recent study conducted by the International Data Corporation (IDC), India is the fastest growing market in the global Top 20 smartphone marketplace, witnessing an impeccable annual growth of 14% in 2017, with a total shipment of 124 million units. To add to that, even Rural India has observed a staggering growth in the mobile Internet business. Moreover, the Govt. of India’s recent draft eCommerce policy is tailor-made for start-ups to thrive, and essentially topple over established giants such as Amazon, Flipkart and Reliance. Even in the midst of a recent national economic downturn, India’s eCommerce industry saw a gradual rise in consumption demand. Lack of readiness: Most start-ups ignore the process of conducing prelaunch training for its staff, while also failing to collect adequate information and consumer response, with necessary market research. According to industry experts, it is essential for start-ups to test market waters so they can make needed adjustments post launch and manage expectations accordingly. Most Indian start-ups try to make inroads into the industry without a clear-cut business model or product line. Can’t differentiate product with business: According to industry experts Chitrangana, most Indian start-ups try to offer “trending and fashionable products” but fail to establish “a real business” that will draw customers to return again and again. “This is a classic case of confusing product with business,” says Nitin Lodha, the father of the O2O model and a specialist in helping eCommerce start-ups. Lodha, who represents Chitrangana.com, believes start-ups expect quick returns from their investments and therefore don’t follow through with a game plan. “Start-ups should not alter product line based on market trends, they should stick to a clear-cut business plan,” adds Lodha. 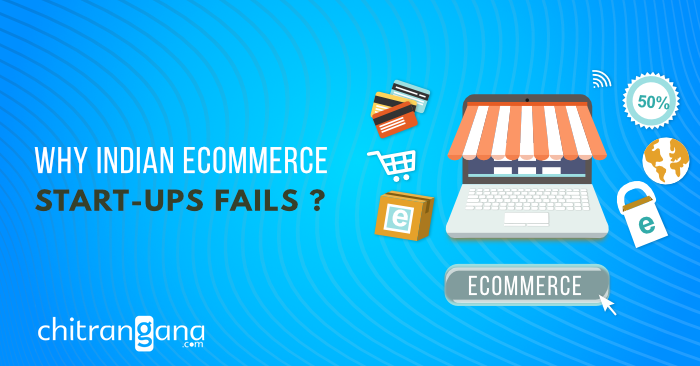 Underrating importance of technology: This is one of the most common and biggest mistakes made by Indian eCommerce start-ups. They underestimate the importance of technology, by failing to invest in proper IT infrastructure, which is essential to deliver a user-friendly experience. “Most of them feel eCommerce is just about creating a functional website. There’s a lot more to it,” says Vishal Shah, senior eCommerce mentor, Chitrangana.com, with more than 15 years of experience. “Since more than 75% users browse using smartphones, it is important for Indian start-ups to deliver mobile-friendly experience. But I have observed that they rarely meet the Google-offered guidelines,” adds Shah. According to Shah, a number of amateur software firms, mislead start-ups in the name of “Responsive Mobile Design” and the naïve clients buy the myth that their websites are mobile-friendly. Working without consultants: Most Indian eCommerce start-ups, especially those targeting domestic markets, try to enter the market without seeking the help of industry experts. Why exactly do they need consultants? It’s not just for advice on product line, but consultants can aid start-ups every step of the way, and help forge partnerships with necessary service providers such as payment gateway, courier services, branding agencies and suppliers. Without consultants, start-ups would have to establish these relationships on their own, a time-consuming and arduous task that is likely to hamper business. Scaling too fast: According to a recent survey, almost 75% global internet start-ups fail because they peaked too soon. While these figures don’t do justice to Indian start-ups, it can’t be ignored that many start-ups in India exhausted their funds on the unnecessary segments. For example, instead of enhancing technology, they allocate budget to expand staff or for extravagant marketing campaigns. Industry experts believe Indian start-ups should focus on things that make their business more viable instead of spending money on unnecessary luxuries. Fear of rejection: In the informed opinion of Mukta Sharma, CMO and renowned marketing innovator in the U.K., Chitrangana.com, a number of Indian start-ups lose inspiration and focus after preliminary market reaction, which is mostly always negative. “It is essential for start-ups to trust in their experiments and follow through with a gamplean, instead of constantly altering their strategies due to fear of failure. They need to change this mindset and focus on positives of each failure, and apply those lessons to improve business,” says Sharma, who has helped several global eCommerce start-ups with his innovative marketing campaigns. According to Sharma, most successful franchises used their initial failures to their own advantage. Unclear business vision: With hopes of pleasing customers from various demographics, a number of Indian start-ups try to execute multiple projects at once, instead of focussing on a specialised product line. “They try to juggle too many hats,” says Aabid Ali, Director, Business Intelligence Wing at Chitrangana.com. “They should try to focus on one project. By trying to do much, they fail to drive marketing campaigns to keep consumers interested. To succeed in cutthroat eCommerce market, start-ups need personalised strategy, clear-cut strategies and long term vision,” added Ali.